In the previous piece, we examined the decision process which led to war, seeing how alliance leaders used the full powers of their bureaucracies to generate effective information and make clear decisions (at least, in theory – we cannot dismiss the possibility of wars starting with less rigorous examination). However, once this decision is made, there is still preparation to complete before embarking on the process of a major conflict. To shed some light on this subject, Crossing Zebras caught up with Chiimera, a member of The Imperium’s Coordination Team, analogues to a real life general staff, and asked him a few questions. Hopeful Turtle: What other groups do coordinators work with when planning campaigns? Chiimera: Coordinators are the second level of what I would call The Imperiums’ strategic division with the ‘Top Men’ being the Skyteam followed by coordinators. The coordination team receives directives from the Skyteam or Imperium directors and enacts them. These tasks can be as simple as destroying a hostile Raitaru anchoring in NPC Delve or as complex as taking a whole region. Coordination works closely with Recon, Scouts and GSOL to pre-stage assets and resources in a way that will improve the likelihood of a successful operation. 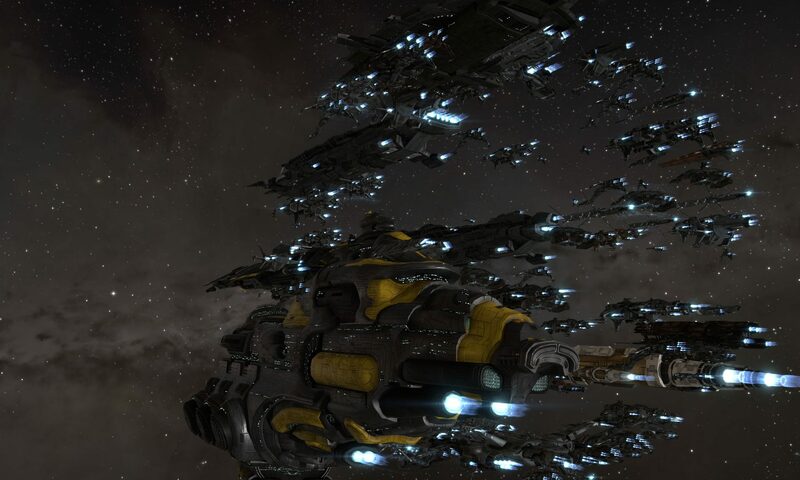 We basically work with any entity that can be a strategic asset in whatever campaign we are working with, when QFC [Querious Fight Club] is under siege we work closely with them to not only provide support fleets where requested but also supply them with a bit of mentoring and intelligence. The next day we could simply have recon watching a blue Fortizar online with FCs ready to respond if required. HP: As a follow-up, how do you work with them? Is there some sort of joint committee, or is it more ad-hoc than that? C: Depending on what we’re doing and who we’re doing it with we’ll be using text chats like Jabber and Discord combined with voice comms as required. The coordination team works collaboratively these days, a lot of discussion about tactics and strategy goes on in the coord channel followed by more of a primary coordinator supported by the other coordinators structure for the actual engagement. HP: How do you pick staging systems? Is it more of a political or military decision? C: Staging systems are exclusively picked for their strategic value. You don’t really need to pick a staging system based on political alignment. If you’re going somewhere in sov null you’re usually going to fight someone hostile to your friends, in that case they’re happy to see you and offer up any assistance they can. If you’re going to NPC Nullsec or somewhere hostile you don’t really care about the hostiles feelings, right? HP: How do you calculate how much materiel is needed at staging? C: Having the right amount of resources in staging is less about how much you have and more about how fast you can replenish your reserve. The simple math off the top of my head would be something along the lines of (Projected Losses over X days + 20%) with X being the number of days it takes to restock the reserve. In the Imperium, most of the staging market and contract stocking is done by individuals. In The Imperium, we’re lucky to have probably the best stocked markets outside of highsec and after a week in forward staging this normally clones over to wherever our people are wanting to buy. HP: When moving materiel to staging, how do you avoid detection? Surely moving multiple Jump Freighters is quite noticeable. C: The only resources that really get moved on an alliance level is strategic assets like citadels, poses and sov stuff which is done by GSOL, I heard that they are magic unicorns that can move thousands of jump freighters at a time without ever being seen. If you think about it the only time you should ever see a jump freighter is when it undocks to jump or when it docks from jumping. Highsec freighter alts and freighter and jump freighter services are a thing so it’s completely possible in a lot of scenarios to move a large amount of assets across the universe without ever undocking yourself. HP: When choosing which people to involve in planning, how do you avoid spy infiltration? C: You can never truly rid an organisation as big as The Imperium of spies, especially in the new world order of open recruitment and alphas. The best you can do is compartmentalise information in a way that doesn’t hamstring your ability to work effectively. The coordination team recruitment process makes it quite difficult to become a member and even before you gain access to any operational channels you’ll end up doing a tonne of work. Even after you join coord proper you don’t automatically gain access to everything. HP: After doing this planning, is there a final go/no go? If so, how does that work? C: The final go/no go usually happens after the fleet has formed but before it’s committed to a fight. There are other checkpoints along the way and other decisions that need to be made afterwards as well. For major ops, the decision is usually made by consensus between the most senior coordinator in channel and the fleet FC. HP: How much pre-planning goes into move-ops – is it a careful operation or a blundering herd? C: I decline to answer the question for fear I may incriminate myself. HP: How do you stop the enemy from interfering with move-ops? C: The secret to a successful move op is treating it like any other fleet, have scouts and don’t do dumb things when things look sketchy. So, whilst Chiimera is constrained in some respects by OPSEC, we can see from his answers that a great deal of work and activity goes into the military planning of operations, as distinct from the political and diplomatic element. This is especially notable when dealing with major bloc conflicts. The one key and unfortunate drawback from a research and learning perspective when considering the art of strategic planning in EVE is that each conflict is inherently quite different; the conquest of Fountain in 2012 and the Refubee War in 2016 had only minor similarities, due to differences in game mechanics and political situations. Therefore, any serious examination of the strategic art in EVE will be inherently transient in character.